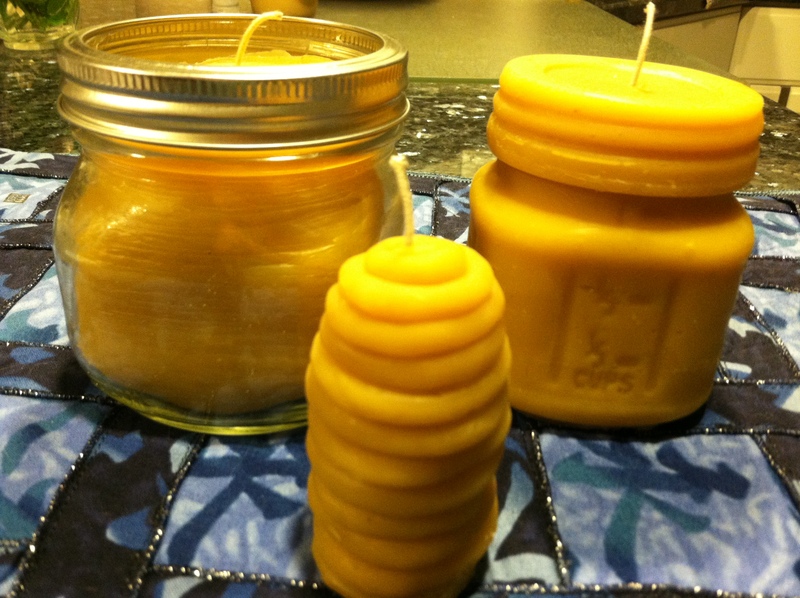 In the dry air of winter, I go through a lot of “body butter”.And what better way to put to use the beeswax and honey that I gathered from the hive last summer? I bought body butter from Burt’s Bees at $15 for a small tub and it was adding up. I like to apply it all over my body after I shower and the butter goes on smoothly and sinks right into your skin and really hydrates. 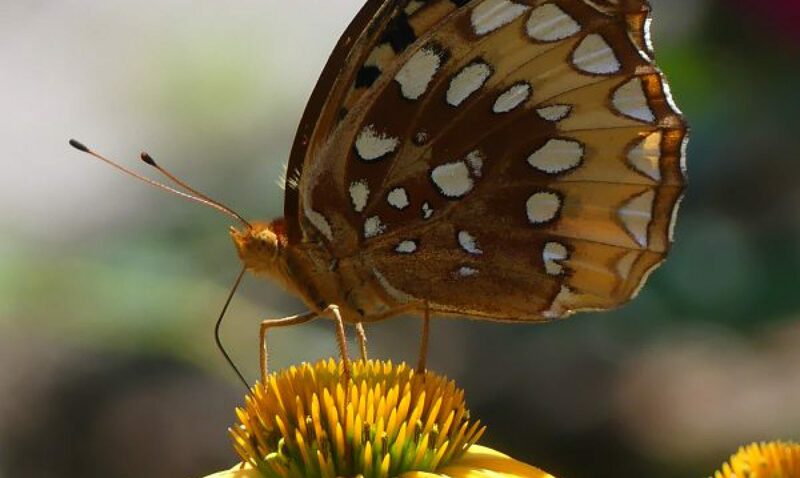 Updating on one of my older posts at Luscious Honey-Scented Body Butter, I find that this has become one of my most popular posts of all time. 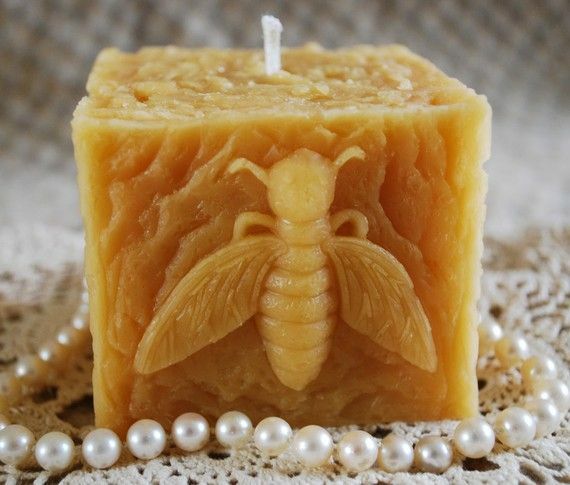 For other uses of beeswax, go to Honeybee Gift-Beeswax or Orange Citrus Soap With Beeswax. After going through some recipes on-line and experimenting with several, I came up with one that works great and costs about half of what I was paying Burt’s Bees. 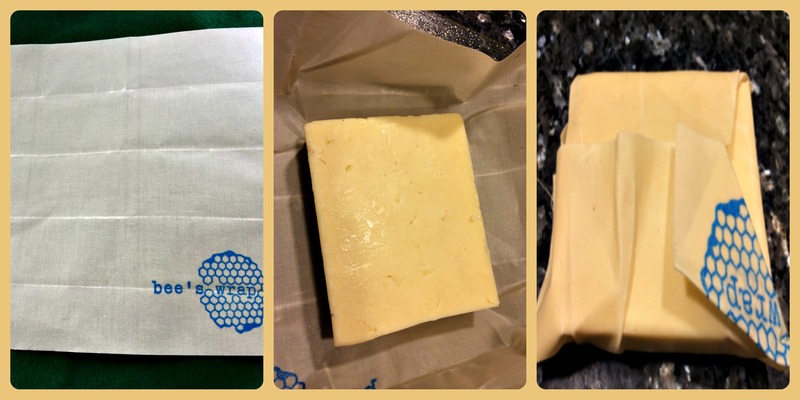 Plus, I made a dent in all of my horded beeswax. The whole process is so easy, I don’t know why I was spending all that money before. The butter is a little thicker than others that I have tried because of the addition of beeswax but it still feels light and creamy. 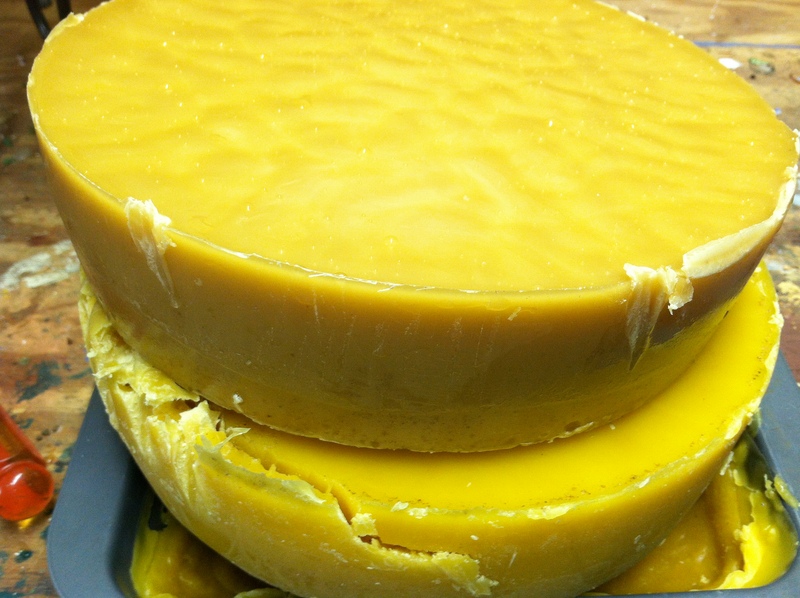 Beeswax: Forms a light coating on the skin helping to hold in moisture. 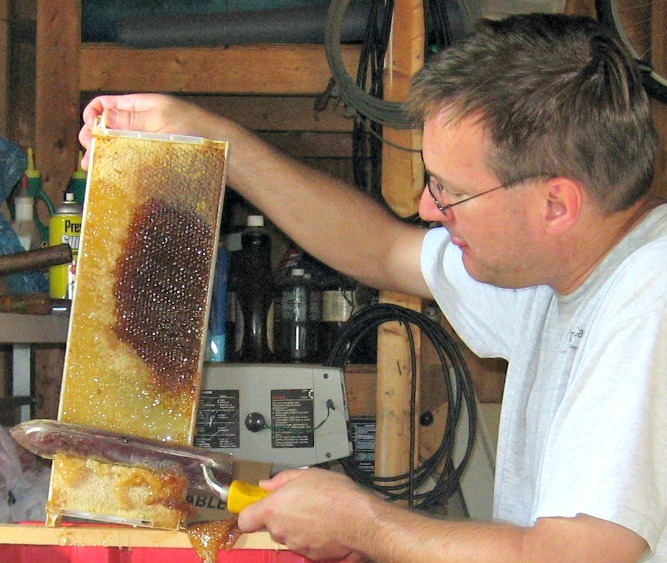 If you don’t have your own hives, contact a local beekeeper to buy some. 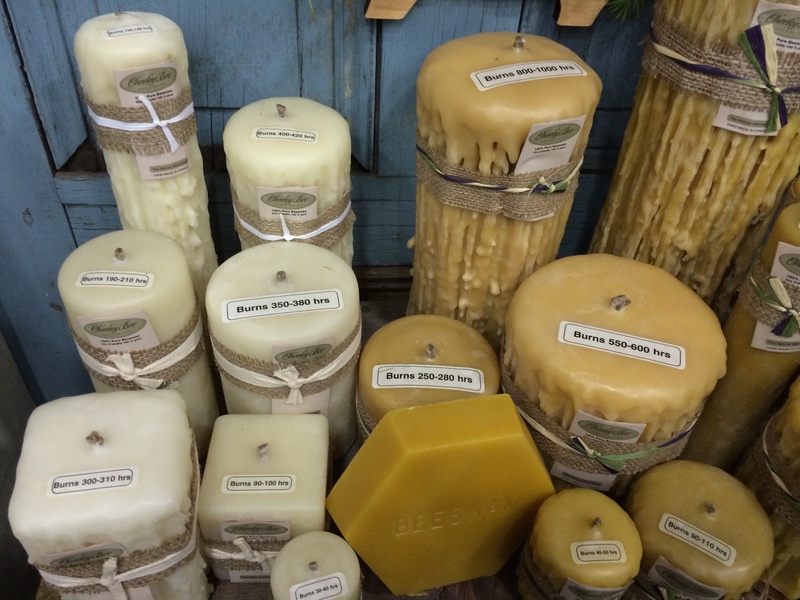 Available on-line also, and you can buy beeswax already grated which is easier to use. Raw Unpasteurized Honey: Adds moisture to the skin and helps lock it in, while providing protective benefits. 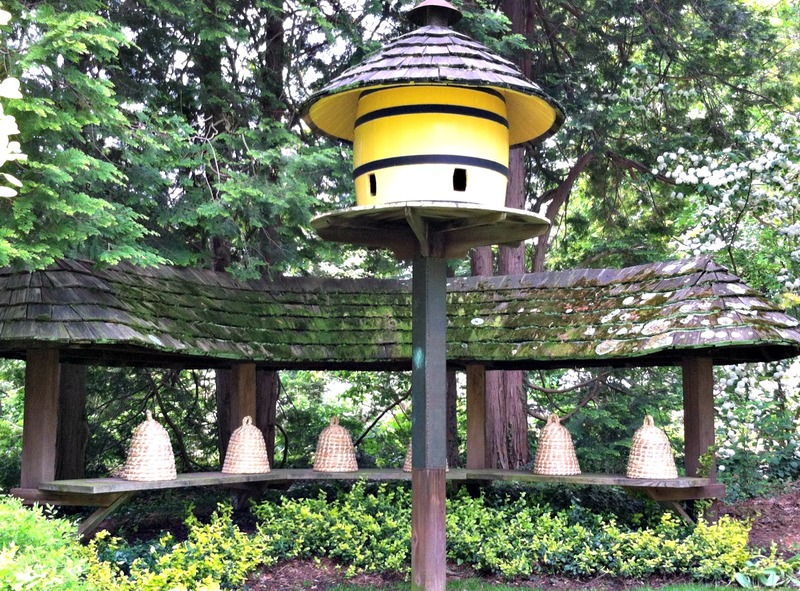 Find a local beekeeper. Coconut Oil: Naturally rich in proteins which help keep the skin rejuvenated. 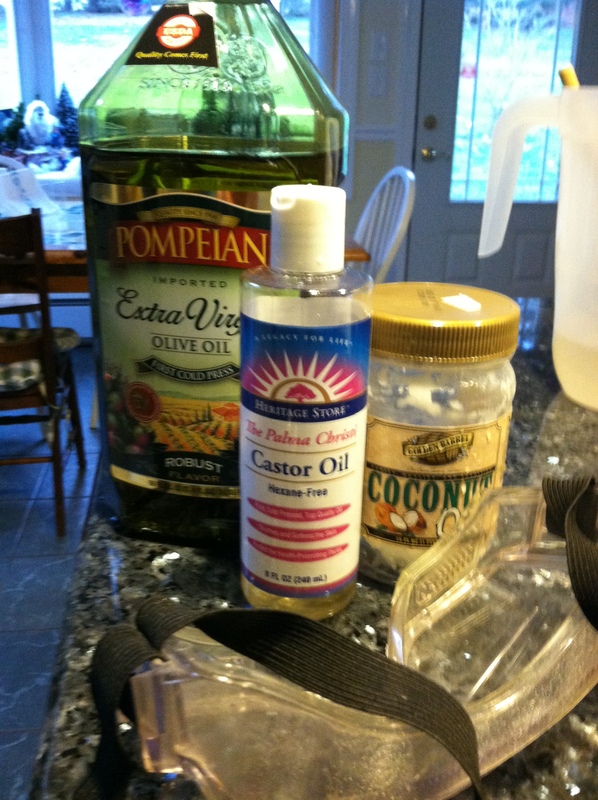 Coconut oil is becoming ubiquitous in the stores and I am finding more and more uses for it. 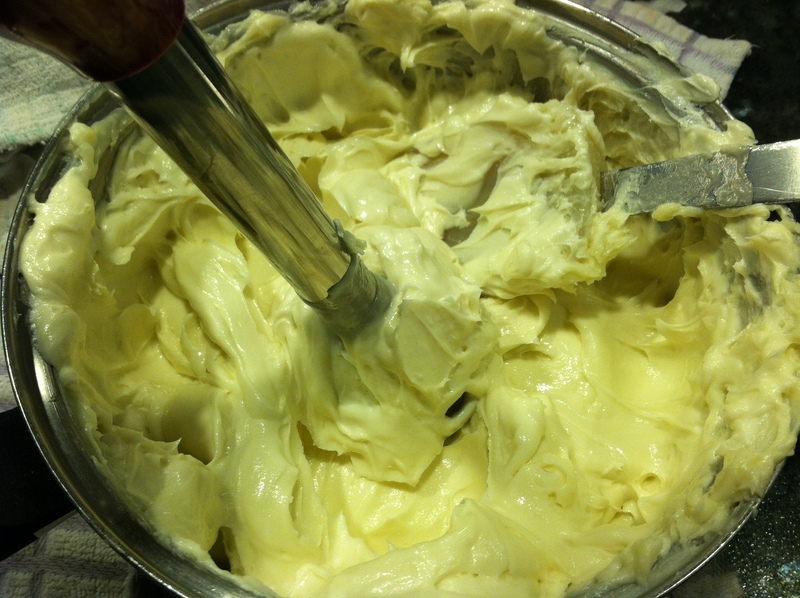 Shea Butter: Vitamins, minerals and fatty acids moisturize and revitalize dry skin. Sweet Almond Oil: Softens and hydrates skin. Essential Oil: Adds aromatherapy benefits and supports healthy skin. I used lavender oil, but the possibilities are endless-bergamot, lemon, scented geranium, orange, peppermint. 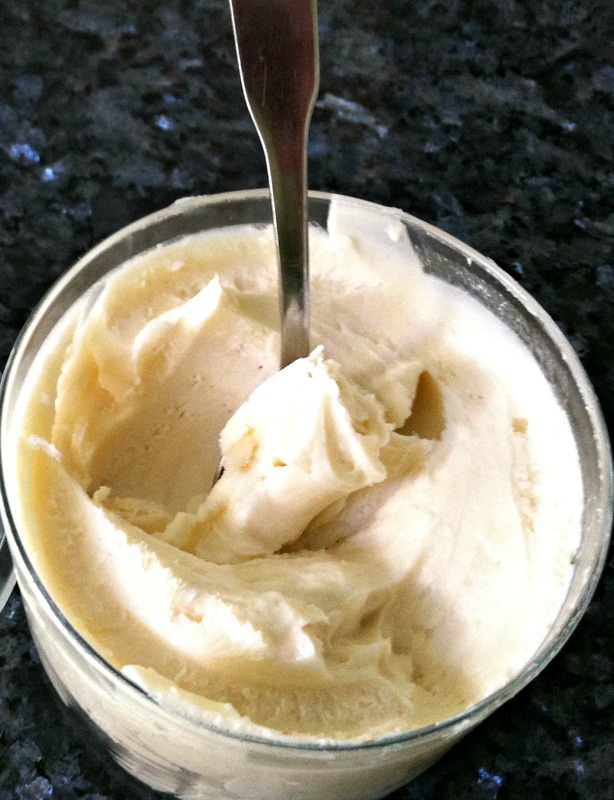 I especially like the flavor of lavender and honey and have used this combo in Lavender Honey Ice Cream. 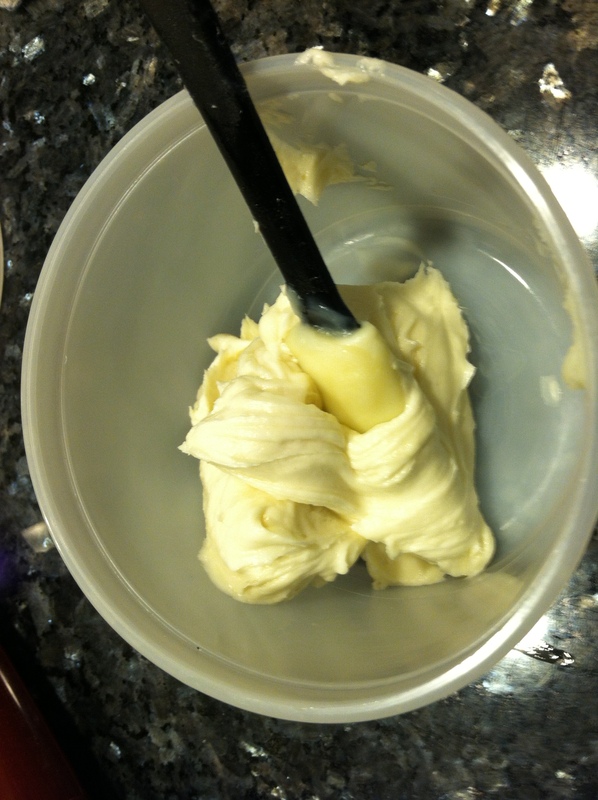 Melt the Shea Butter, Coconut Oil, and Beeswax in the top of a double boiler until all lumps melt. 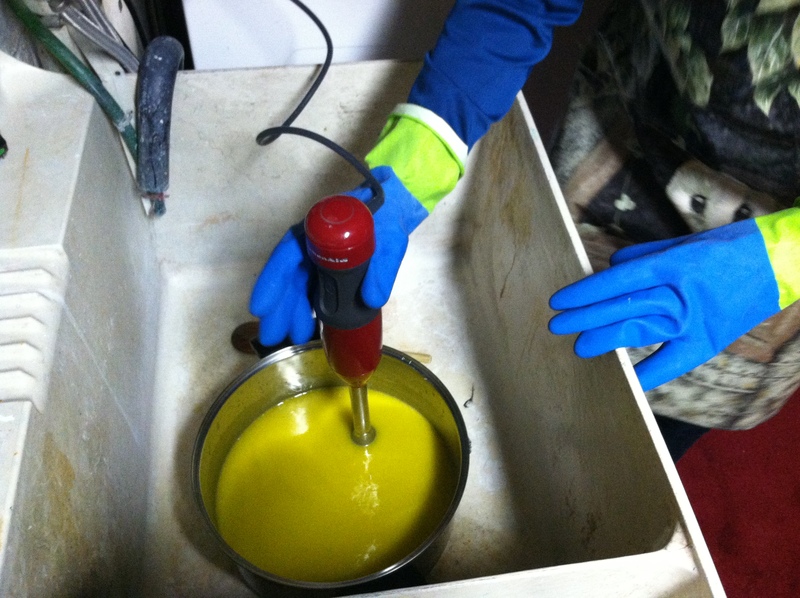 The Beeswax has the highest melting temperature, so will be the last to melt. Beeswax has honey deposited in it so you get the fragrance of the honey from your added beeswax, as well as the added liquid honey added at the end. Remove from heat, letting cool slightly, and add the Sweet Almond Oil. Place the whole thing into the refrigerator until the mixtures turns almost hard and opaque. This could be 15 minutes or less. If you let it harden too much, just return to the heat to melt the mixture again. You want it soft enough to whip, but not too hard that the mixture will form lumps. Creamy smooth is the key, not hard and solid. 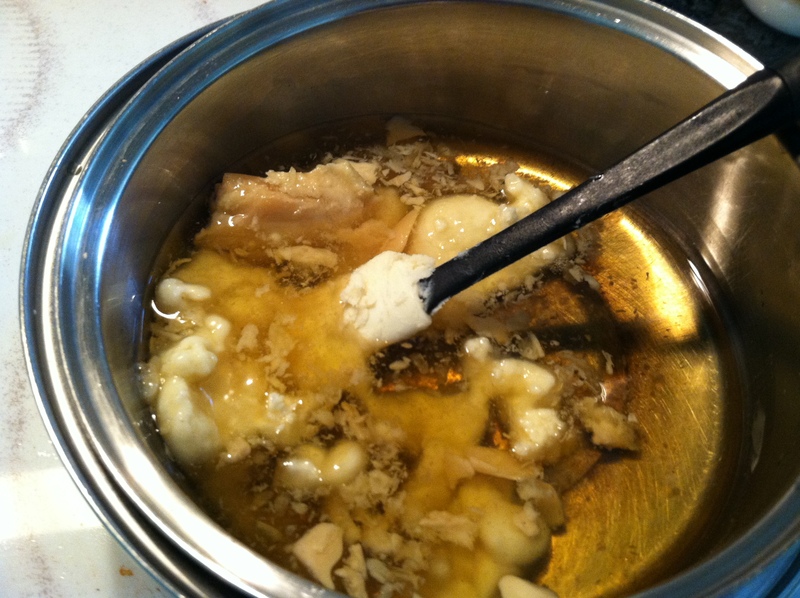 While in the refrigerator, the mixture will turn opaque and become very thick. Bring the mixture out, adding the honey and the lavender oil and whip it with a mixer or immersion blender until thoroughly mixed. The more air incorporated, the lighter the mixture. Scrape into containers. I used an old Burt’s bees container and some small mason jars. Scooping out the butter into containers It is the perfect consistency! 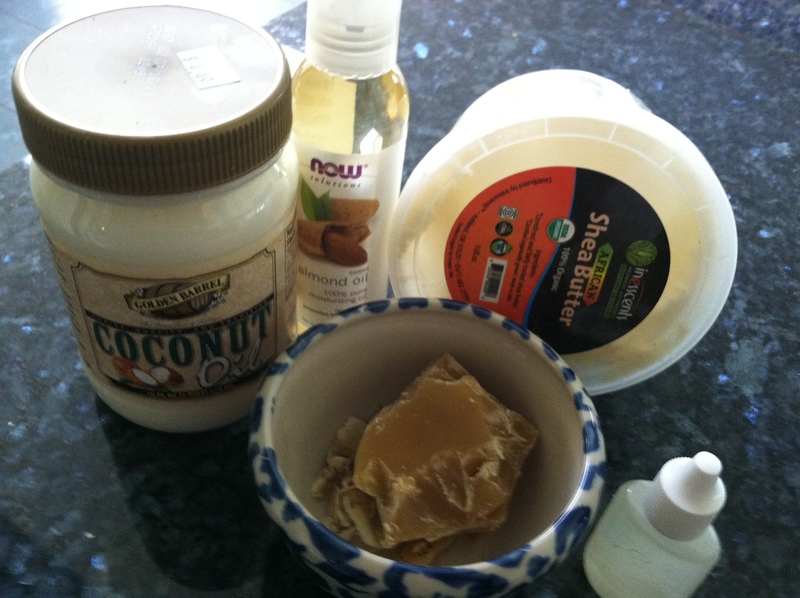 With this recipe, I made about 3 1/2 cups of body butter that cost about $25 for materials. I was spending $15 for a 6.75 ounce container from Burt’s Bees. After some calculation, I figured that if I bought 3 1/2 cups of body butter from Burt’s Bees, it would have cost me twice as much. Plus, I knew exactly what went into it. I am experimenting with different varieties of handmade soap and I love orange flavor, and recently made some citrus soap bars. They turned out great, so wanted to share this variation using a base of olive oil soap. 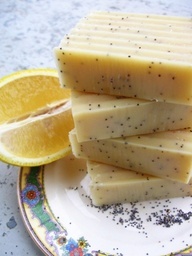 I call it Beeswax Citrus Soap. 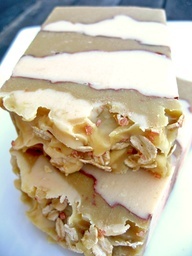 Think how good this soap is for your skin with all this olive oil and beeswax! Beeswax softens and protects skin from environmental elements and is naturally nourishing and antibacterial and anti-allergenic. the addition of orange peel adds to the exfoliant properties. Orange Citrus SoapI love handmade, preferring it to the commercially overly scented variety, picking it up at local craft fairs and boutique stores. The cost was adding up, plunking down $5 or $6 for a small bar, and I looked into making it at home. I have always hesitated to make soap due to the use of caustic lye in creating the chemical of making soap, which is called saponification. In the old days, when people had to make their own soap, they made lye with wood ashes. They would take the white ash left over from a hardwood fire and boil it with rain water, and liquid lye would float to the top. Commercial lye which is also used as a drain cleaner- very toxic!!!! 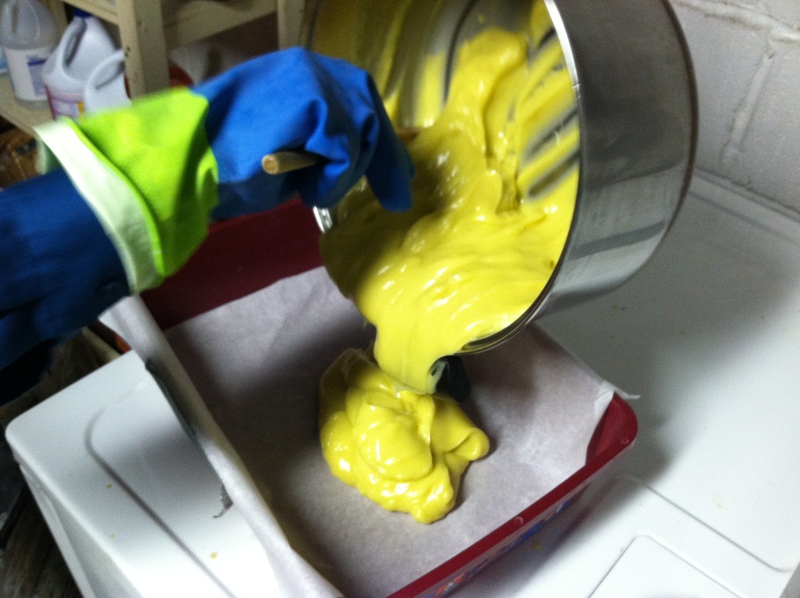 I recommend making soap in your kitchen or basement laundry tub where curious kids and pets cannot get into it. A caustic substance, lye has to be handled very carefully. If you use common sense, and pay attention to directions, you will be fine. Keep a bottle of white vinegar handy, if you spill any caustic lye on your skin. Assemble all your ingredients and equipment in advance and put on old clothes and an apron, though I have never damaged any of my clothes in the process. Put on your safety goggles and rubber gloves and you are ready to go. The following is your basic procedure and ingredients. The final step is adding your flavoring/scent and you can add any scent at all that you like. Measure 12 ounces of water into the plastic pitcher. Your kitchen scale should subtract the weight of the pitcher from the weight of the water. Everything has to be measured precisely. Set your pitcher in the sink. Weigh out 6 ounces of lye. I used a plastic disposable cup. Pour the lye from the cup into the water in the pitcher NOT THE OTHER WAY AROUND!! And gently stir it in with the wooden spoon. A thermal reaction will occur and the solution will get very hot and give off some fumes. It stinks!! At this point, I set the pitcher outside to cool off – away from animals. I hate the smell of the fumes. 4. 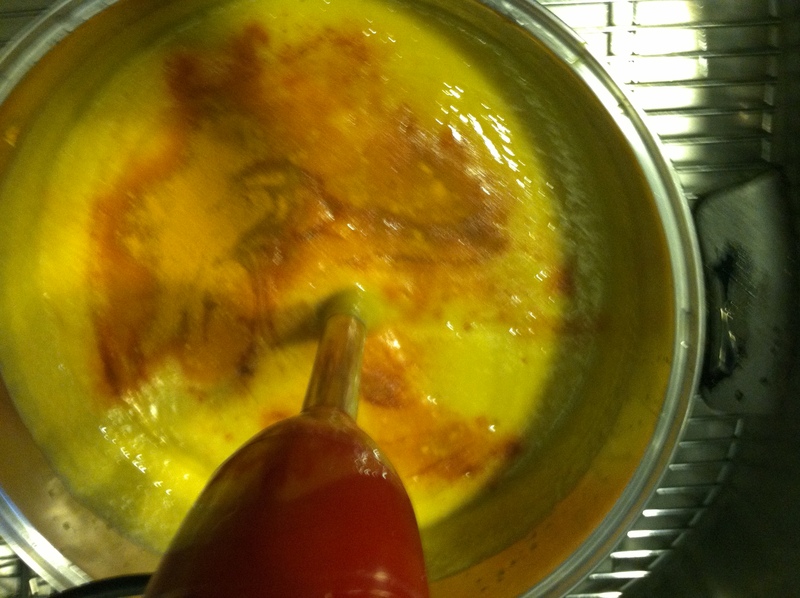 Weigh your oils and beeswax and put them into the wide saucepan and heat on a low heat until everything dissolves. Remove from the heat to cool slightly. 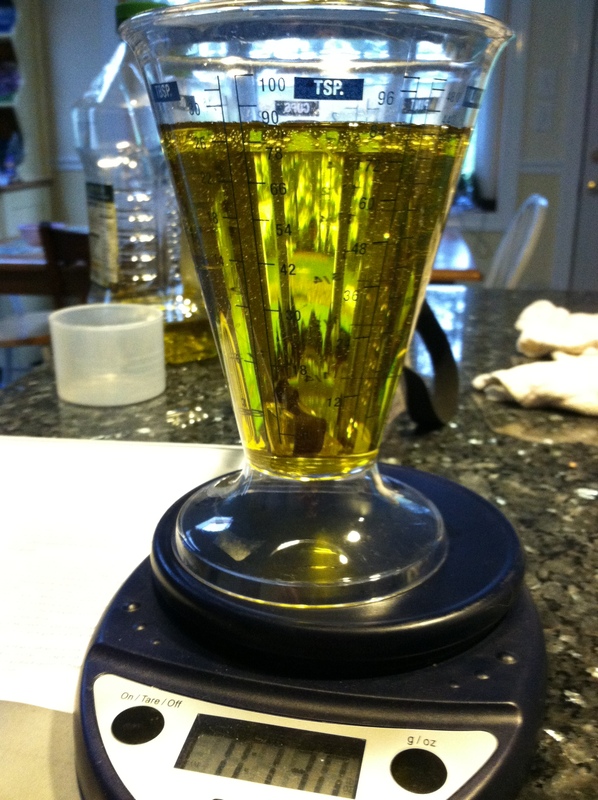 You will measuring the temperature of this mixture to be around 98 to 110 degrees F.
5. Test the heat of the lye solution by touching the outside of the pitcher to see if it is cooling down a bit. It should feel tepid to the touch, not hot. 7. Plug in your immersion blender so it is ready to use. 8. 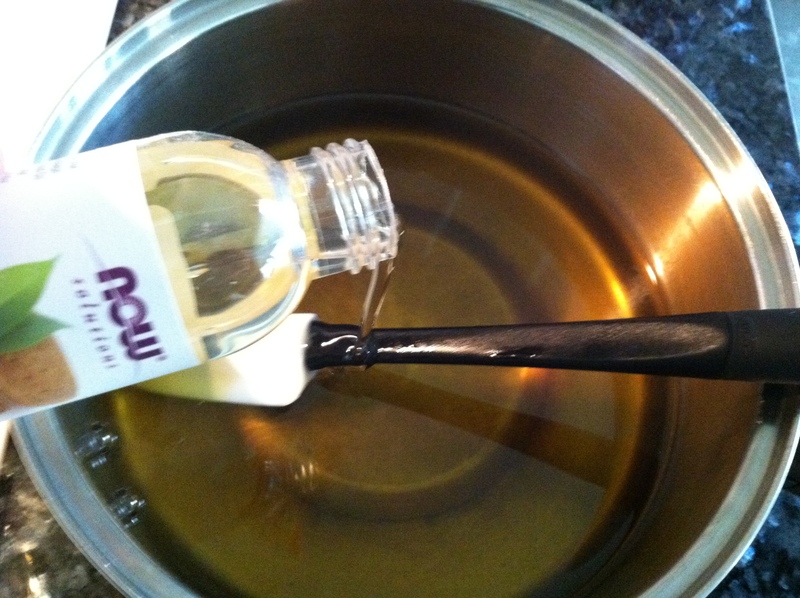 Combine the two solutions once they have reached the right temperatures (see above), pouring the lye solution into the pan of oils and stirring with the wooden spoon a couple of times. 10. Without turning on the blender, immerse it into the mixture down to the bottom of the pan. Make sure that your gloves and goggles are on because you could get splattered a bit. I also like to put the saucepan in the sink for this step. You can do this by hand without a blender, but it will take much longer with a lot of stirring! 11. Turn on the blender and slowly circulate it around the circumference of the pan. Keep blending, watching the consistency. 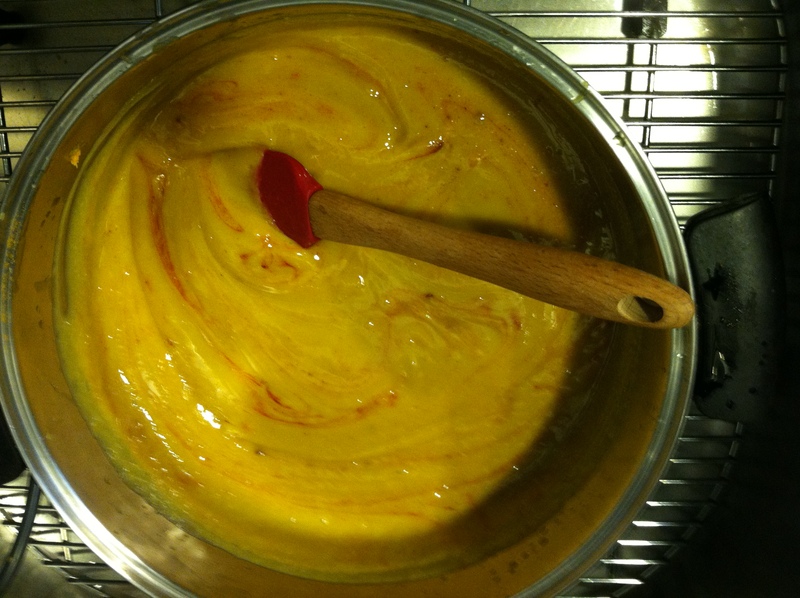 Within a few minutes, the mixture will start turning opaque and thicken. Keep blending until the mixture starts forming a ‘trace’, which is just part of the mix leaving a visible swirl on top. The mixture should be the consistency of runny pudding. 12. Add your essential oils ( I used 1/4 ounce each of lemon and orange oil). 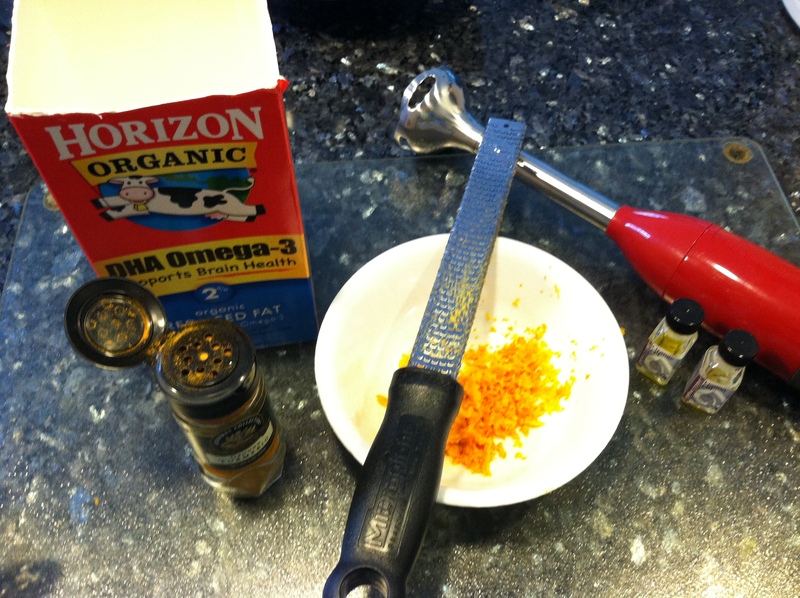 Grate 2 oranges to get about 1/4 cup of grated skin and add to mixture. 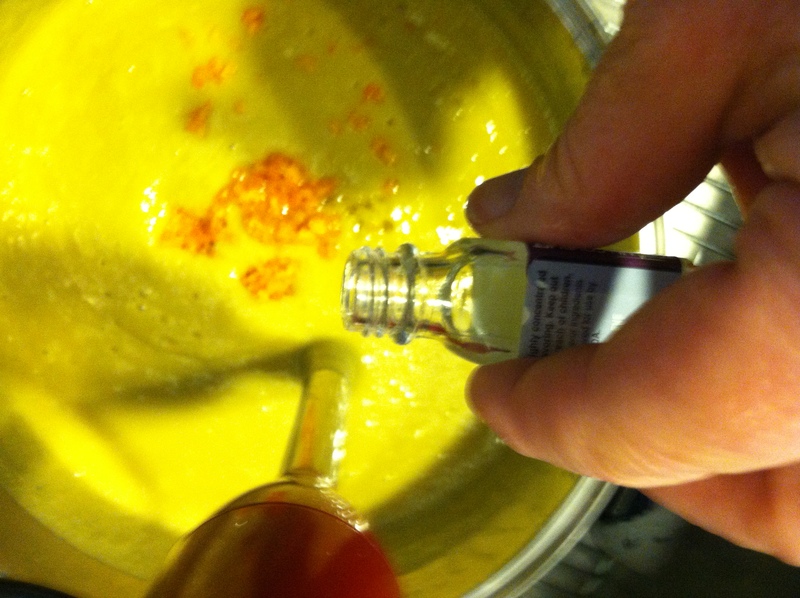 I also sprinkled some turmeric on top to increase the intensity of the orange color. This is for color only, not for any flavor. Mix in and I liked the swirls of turmeric so didn’t mix that in completely. 13. Pour your soap into your mold (here I used a wax covered milk container with the top cut out). 14. Wrap the container in an old towel and set aside for 24 hours. 15. 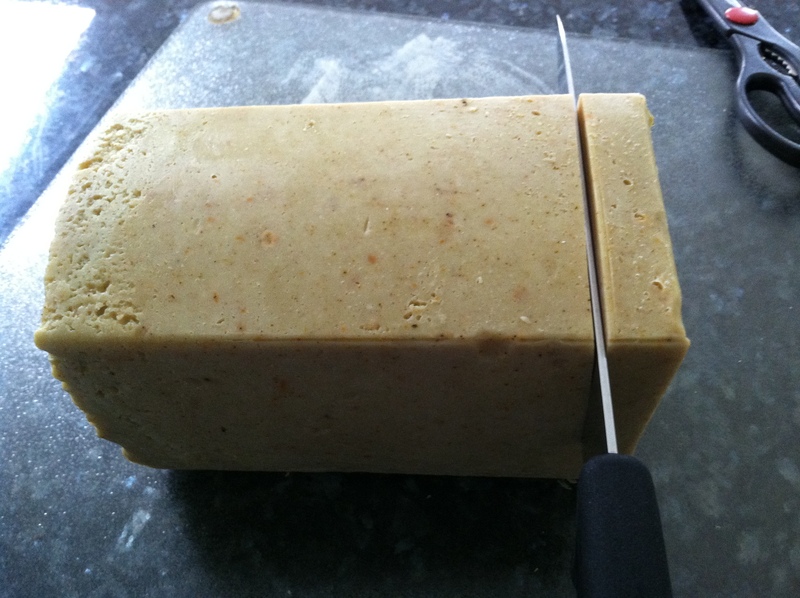 The next day, the soap is still soft enough to be cut into blocks with a sharp knife. I peel off the container and chop it up with a warmed knife. Out of this one batch, I made 20 blocks of soap which should last me a long time for my personal use and lots of gifts. To clean up your mess, I take bunches of paper towels and wipe everything off thoroughly and throw the towels into a garbage bag to go outside. Remember, this stuff is very caustic and can still burn you. The immersion blender I treat the same way, and then take off the blender stick and thoroughly clean it in hot soapy water – same with the digital thermometer. You have to let the soap age about a month before using as it will retain some of its caustic nature immediately after you make it. I leave it out in a sunny window to age it for a few months before using or giving it as gifts. I love handmade soap, preferring it to the commercially overly scented variety, picking it up at local craft fairs and boutique stores. The cost was adding up, plunking down $5 or $6 for a small bar, and I looked into making it at home. 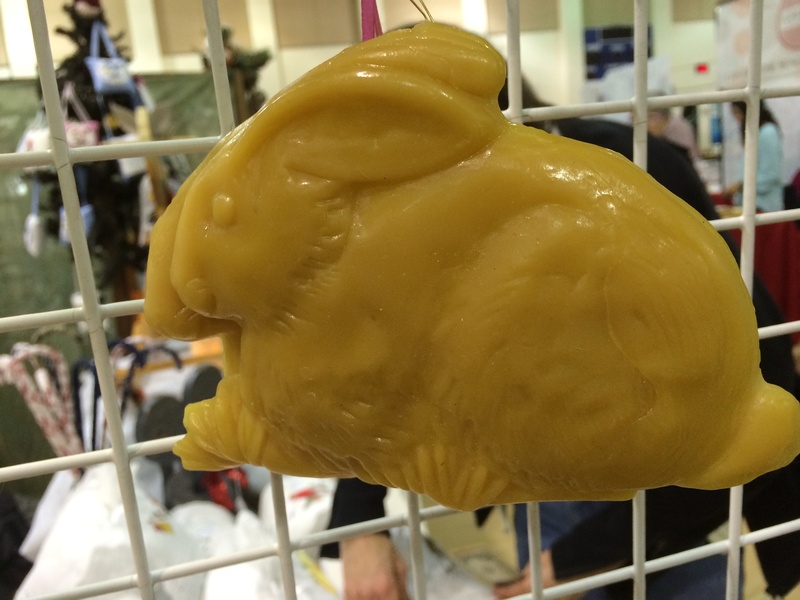 I have always hesitated to make soap due to the use of caustic lye in creating the chemical process of making soap, which is called saponification. 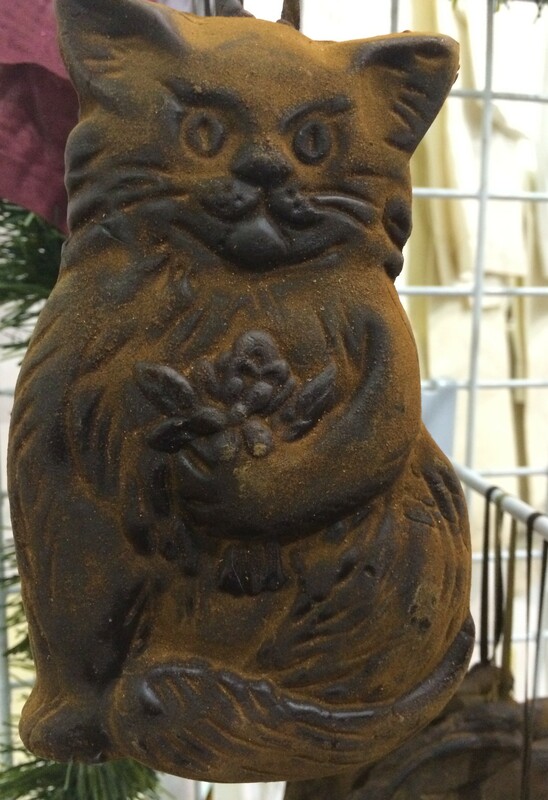 In the old days, when people had to make their own soap in addition to their lye, they made lye with wood ashes. 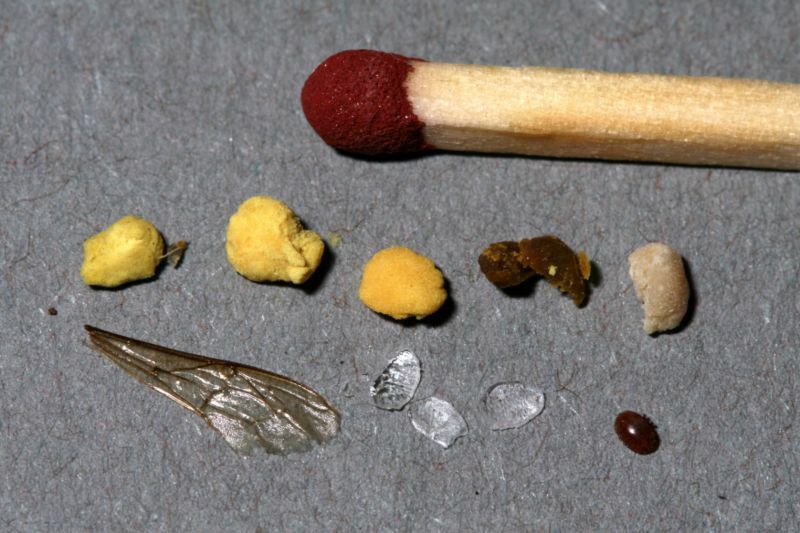 They would take the white ash left over from a hardwood fire and boil it with rain water and liquid lye would float to the top. It sounded so simple, that I really considered doing it for about 1 second and then thought that the soap making would be enough of a challenge without complicating things. Lye is 100 percent sodium hydroxide, NaOH. 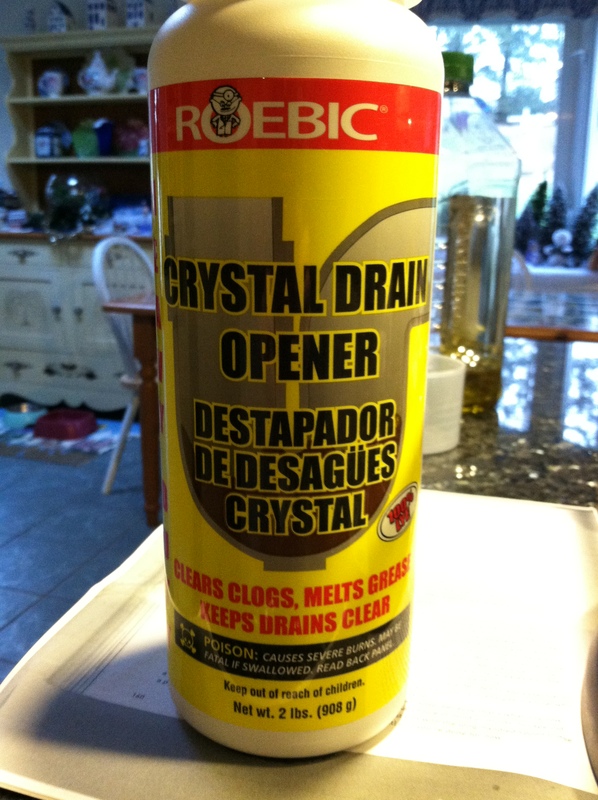 I got mine at Lowes in the plumbing aisle as Crystal Drain Opener. It can be hard to find as it is used in the illegal manufacture of meth ( who would have thought!!!) and it has been pulled from drugstore shelves. You can also buy it online. 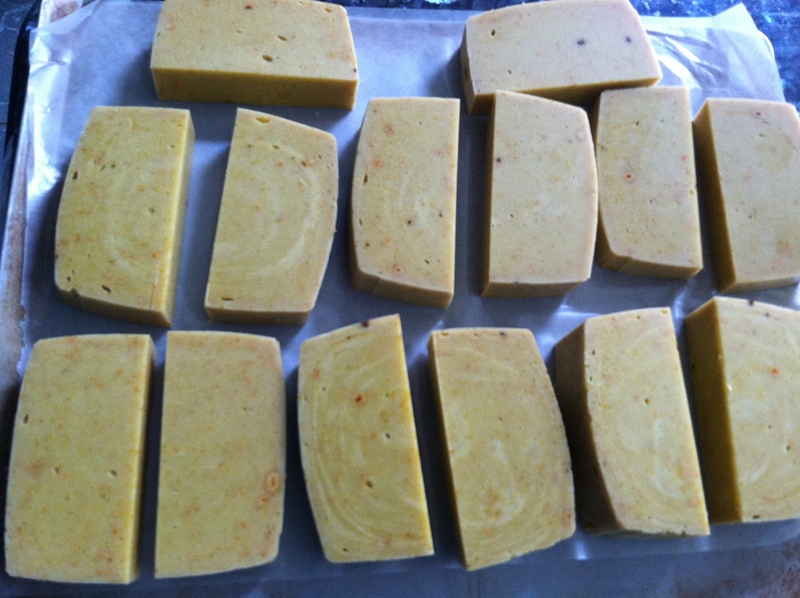 I also wanted to use my accumulated hoard of beeswax in my soap so started looking for soap recipes which included beeswax. 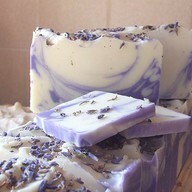 I recommend making soap in your kitchen or basement laundry tub where curious kids and pets cannot get into it. Lye is very caustic and you need to respect that, but don’t be afraid of making soap because of that. If you are careful and use common sense, you will be fine. 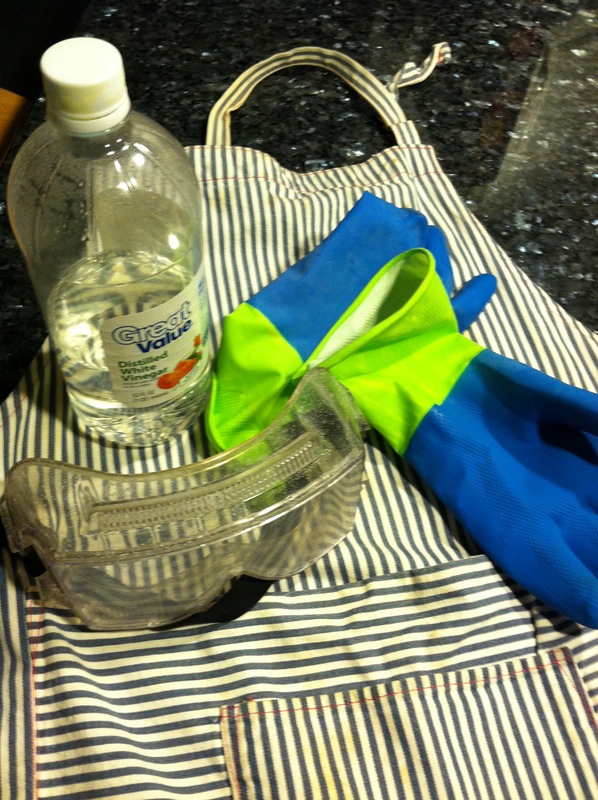 Keep a bottle of white vinegar handy, if you spill any caustic lye on your skin. Assemble all your ingredients and equipment in advance and put on old clothes and an apron, though I have never damaged any of my clothes in the process. 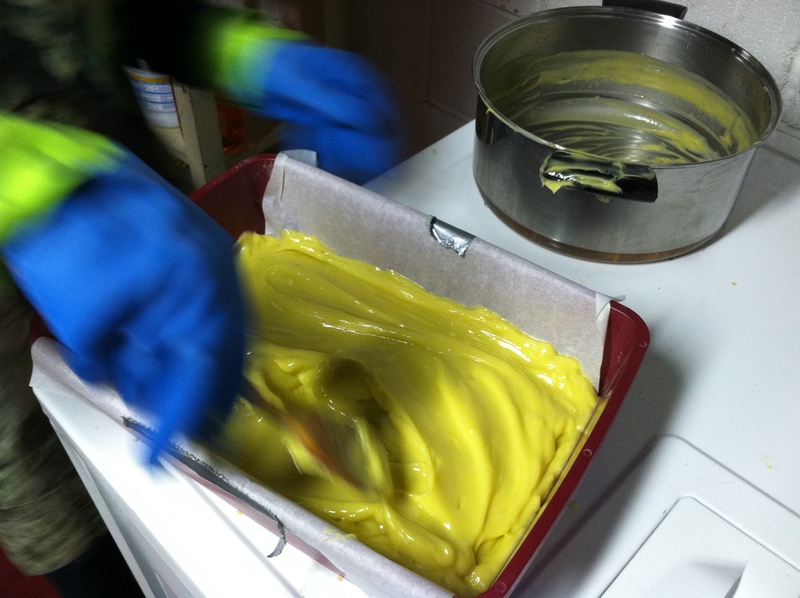 Put on your safety goggles and rubber gloves and you are ready to make soap!! 2 ounces essential oil of your choice ( I used Vitamin E, but the possibilities are only limited to what you can think up)! 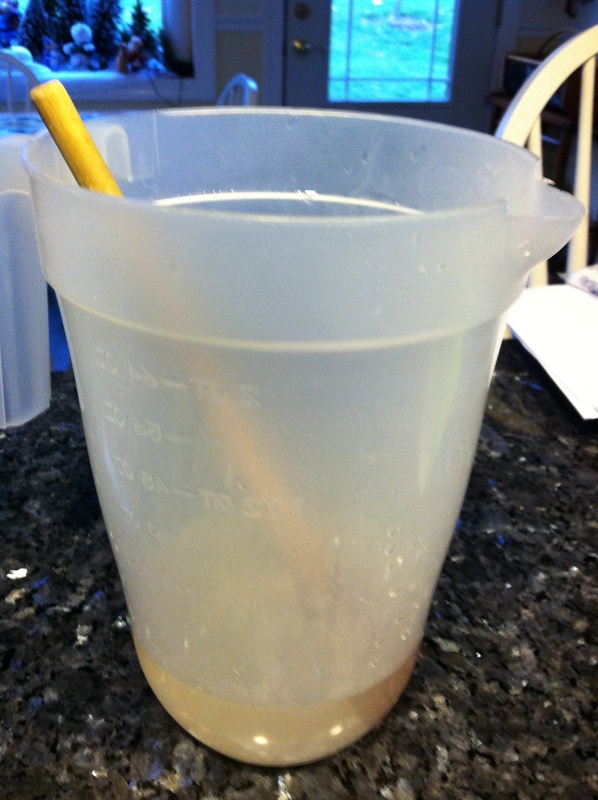 Measure your plastic pitcher first and then measure 12 ounces of water into the pitcher. Your scale should subtract the weight of the pitcher from the weight of the water. Everything has to be measured precisely. Set your pitcher in the sink. 4. 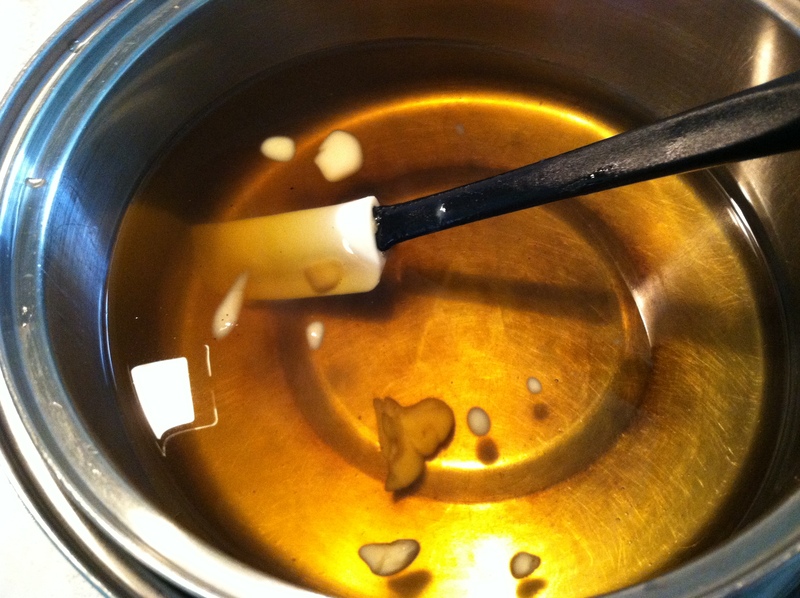 Weigh your oils and beeswax and put them into the wide saucepan and heat on a low heat until everything dissolves. Remove from the heat to cool. 8.Combine the two solutions once they have reached the right temperatures (see above), pouring the lye solution into the pan of oils and stirring with the wooden spoon a couple of times. 10. Without turning on the blender yet, immerse it into the mixture down to the bottom of the pan. Make sure that your gloves and goggles are on because you could get splattered a bit. I also like to put the saucepan in the sink for this step. You can do this by hand without a blender, but it will take much longer with a lot of stirring! 12. Add your essential oil and mix in. 13. 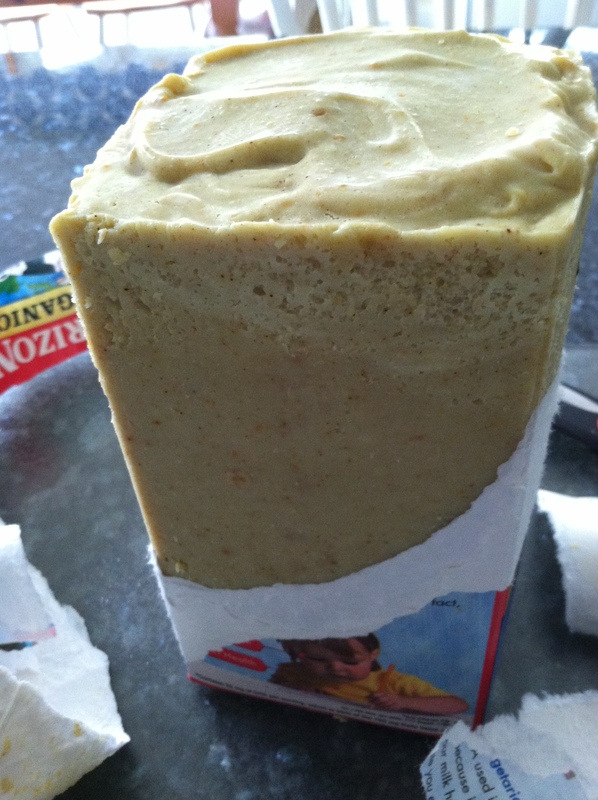 Pour your soap into your mold which has been lined with parchment paper and smooth it down with your spoon. 14. Cover with a board and throw some towels on top and leave it for 24 hours to cool down and harden. 15. 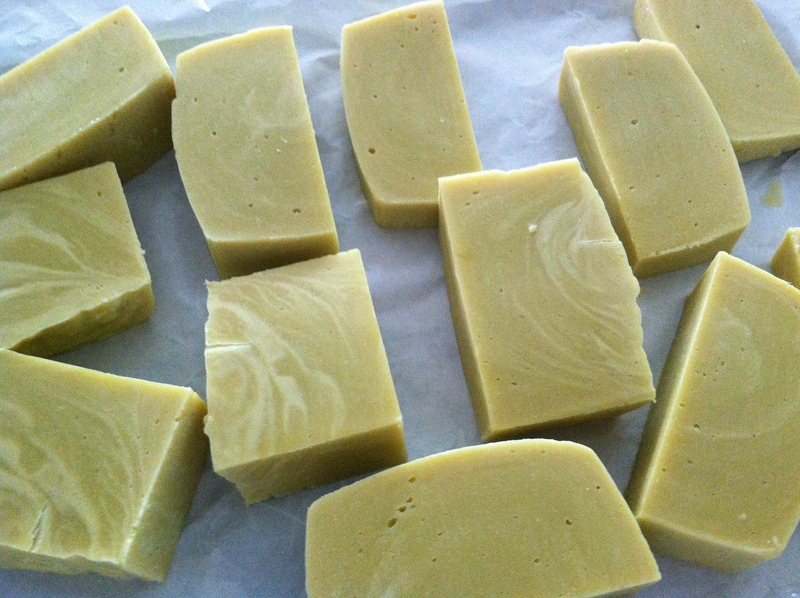 The next day, the soap is still soft enough to be cut into blocks with a sharp knife. 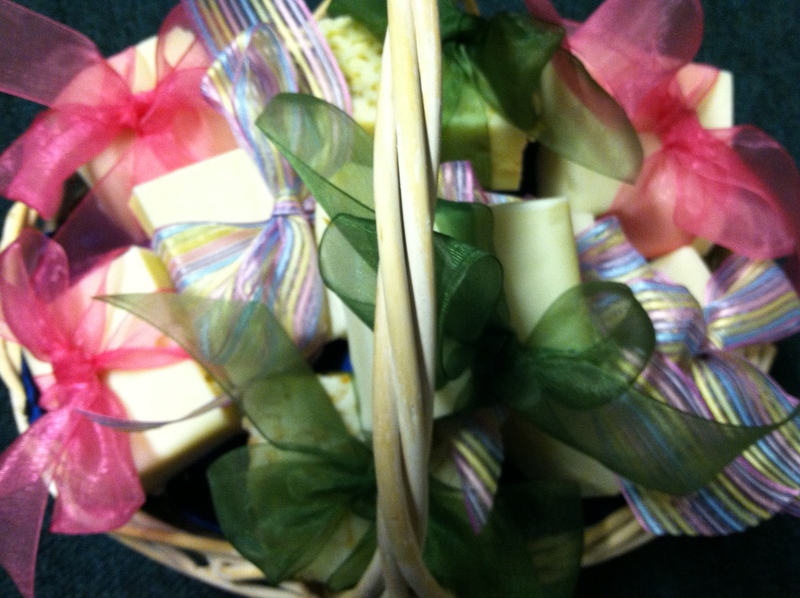 Out of this one batch, I made 20 blocks of soap which should last me a long time for my use and for gifts. 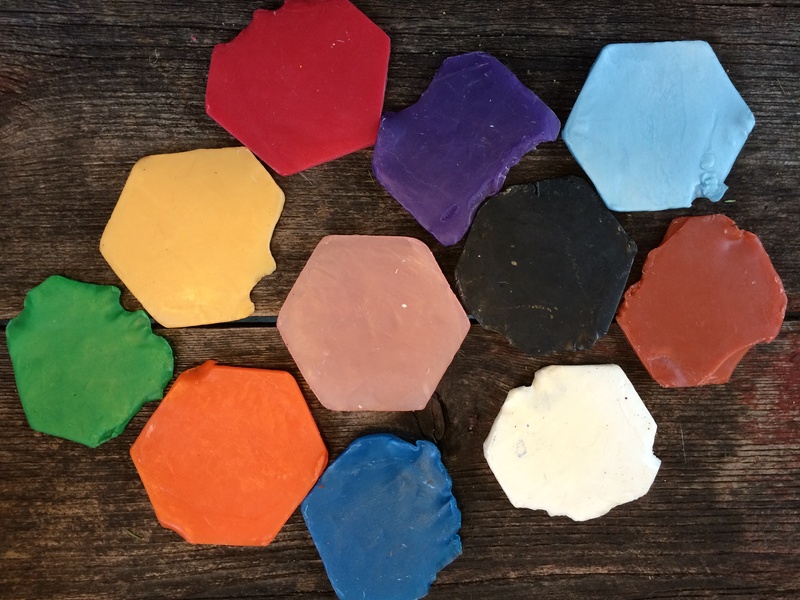 With this soap base, you can add anything to personalize and complement your own preferences, like herbs, spices and colorings. For colorings and scents, you could add chocolate, coffee, tea, paprika, mixed herbs, turmeric, cocoa, cinnamon, mint, poppy seeds, star anise, lavender buds, orange peel, rose buds, honey, marigolds, and orange peel. The possibilities are endless. Experiment! These soaps above look good enough to eat! I tried an oatmeal soap batch where I added oatmeal after the mixture had traced up and was getting thick. I poured the mixture into an empty clean milk carton with straight sides which had one of the long sides cut out. I pressed bubble wrap into the mixture while it was still soft to get the texture of honeycomb. The next time I add oatmeal, I will grind it up into smaller pieces. 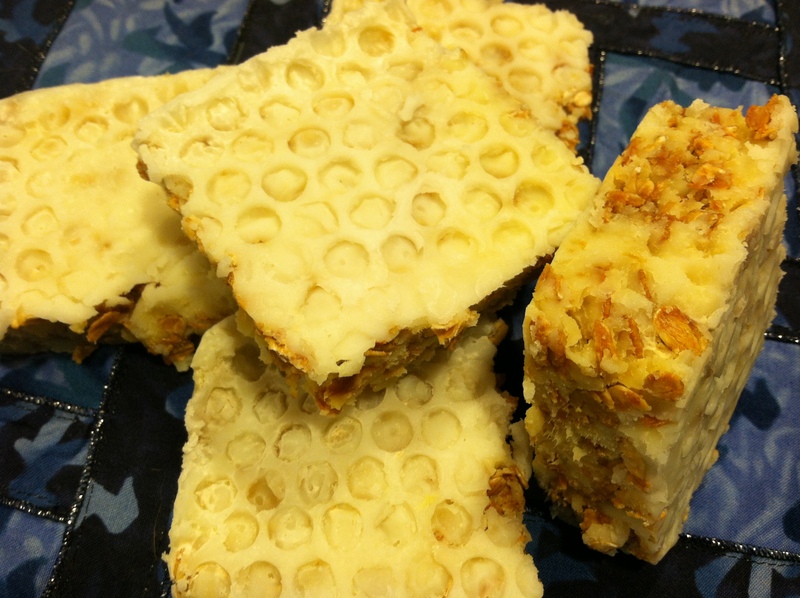 When you use this soap now, clumps of oatmeal fall out! In the dry air of winter, I go through a lot of “body butter”! I have been buying it from Burt’s Bees at $13 for a small tub and it was adding up. I like to apply it all over my body after I shower and butter goes on smoothly and sinks right into your skin and really hydrates. For an updated version of my body butter with lavender, go to my post Lavender Scented Honey Body Butter. After going through some recipes on line and experimenting with several, I came up with one that works great and costs about half of what I was paying. 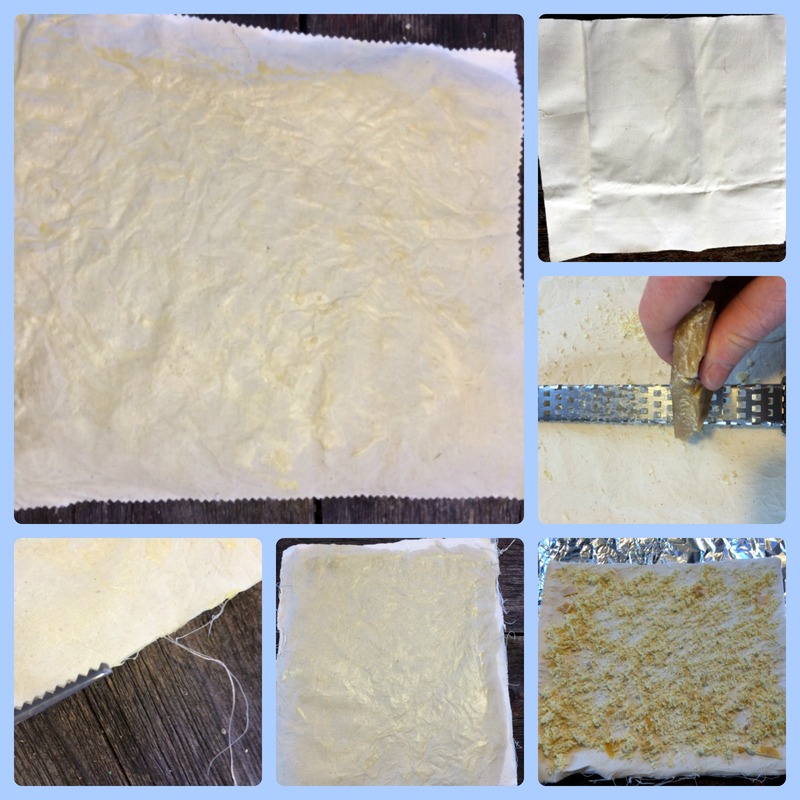 Plus, I got to use some of my beeswax from my hives! The whole process is so easy, I don’t know why I was spending all that money before. 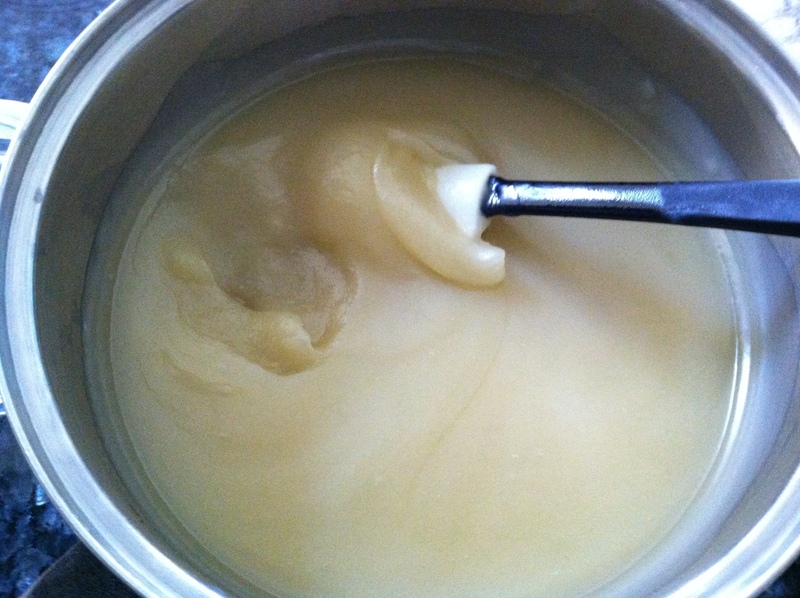 Melt the Shea Butter, Coconut Oil, and Beeswax in the top of a double boiler until all lumps are melted. 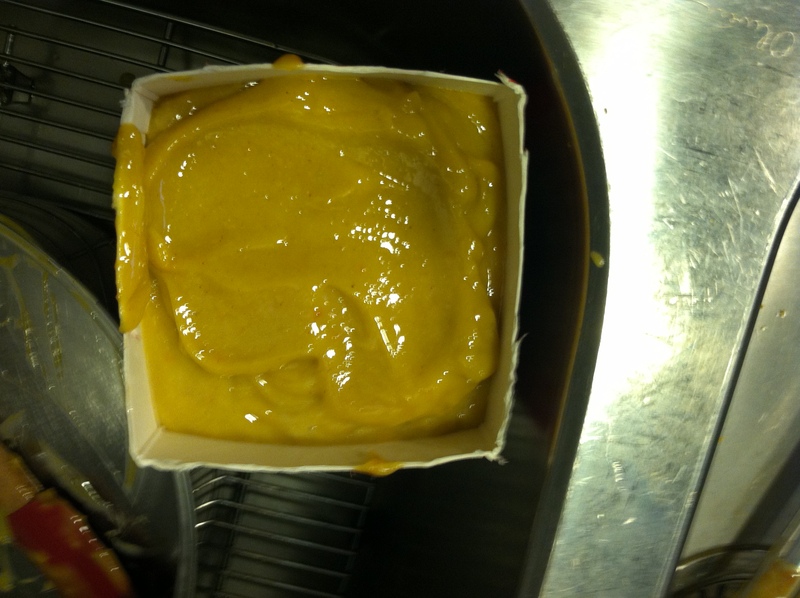 The Beeswax has the highest melting temperature, so will be the last to melt. 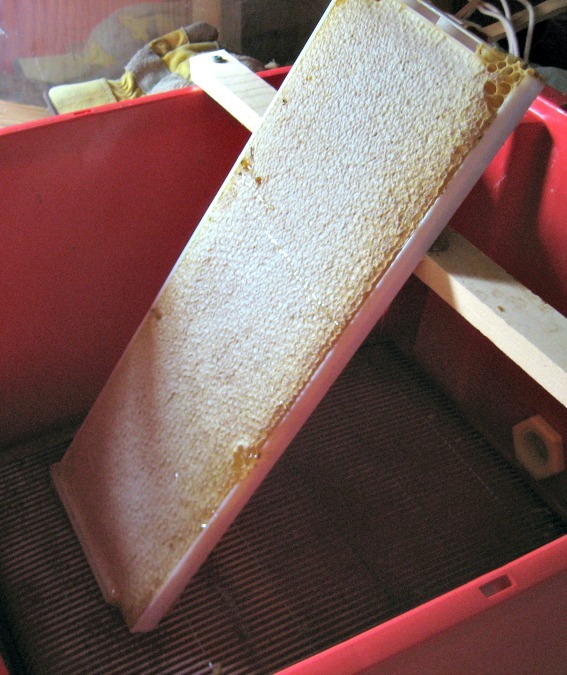 Beeswax has honey deposited in it so you get the fragrance of the honey from your added beeswax. 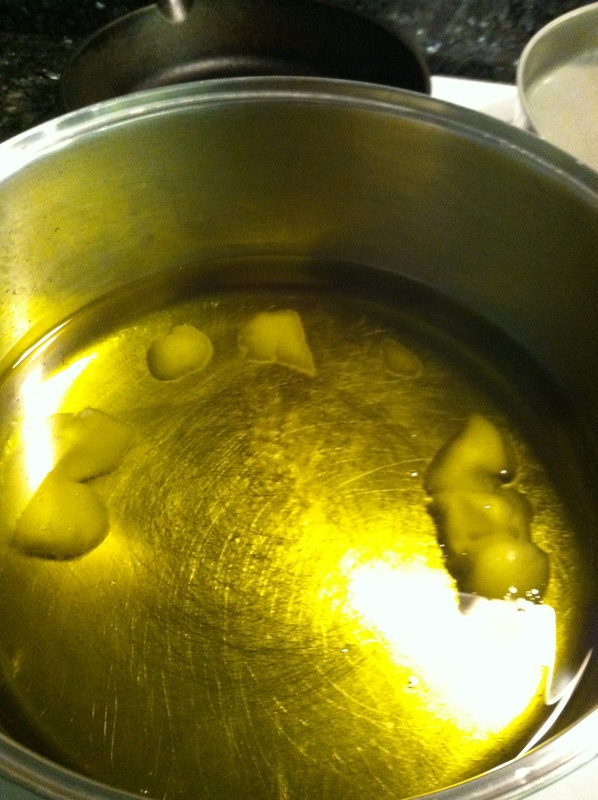 Remove from heat, letting cool slightly, and add the Sweet Almond Oil and the Vitamin E drops. Stir until mixed and place into the refrigerator for about an hour. 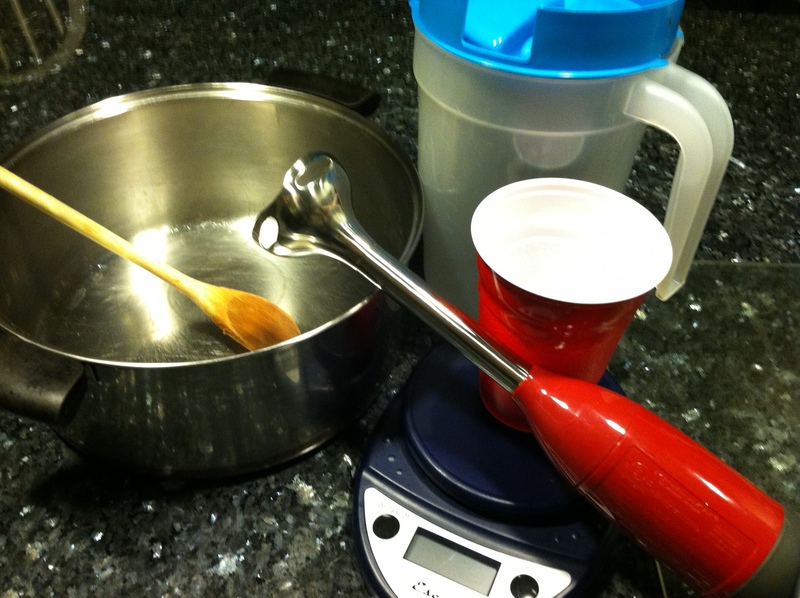 Bring the mixture out and whip it with a mixer or immersion blender or mixer. Place in containers. I used an old Burt’s bees container and just some other containers that I had sitting around. 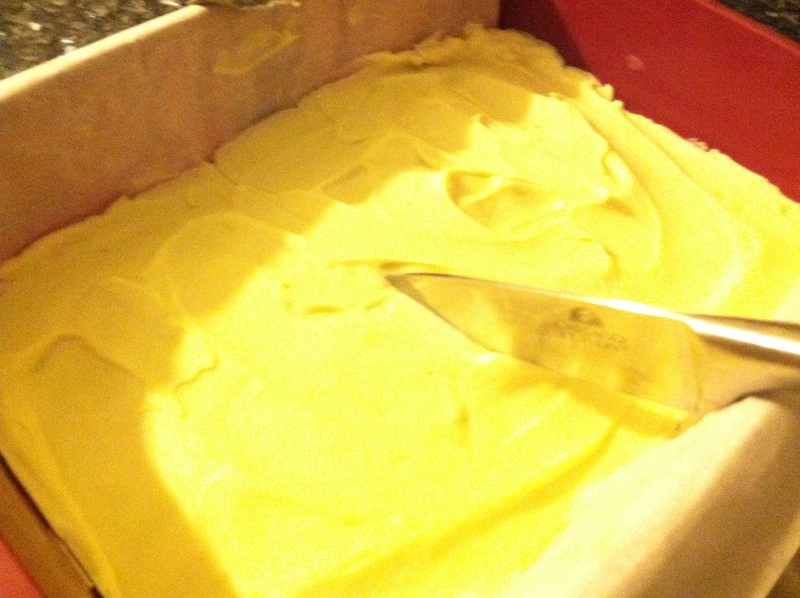 Scooping out the butter into containers- It is the perfect consistency! 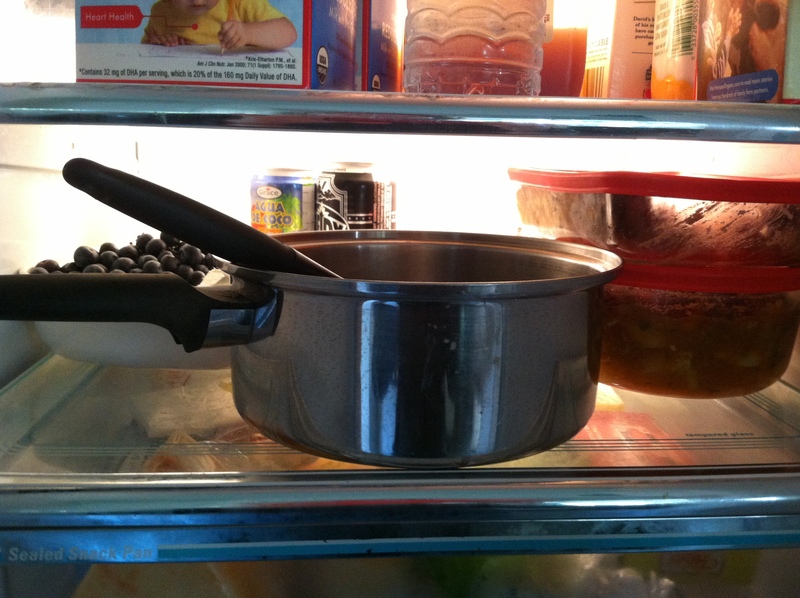 Don’t worry if you forget the mixture in the refrigerator and it gets too hard. Just gently warm it until it softens enough to whip. 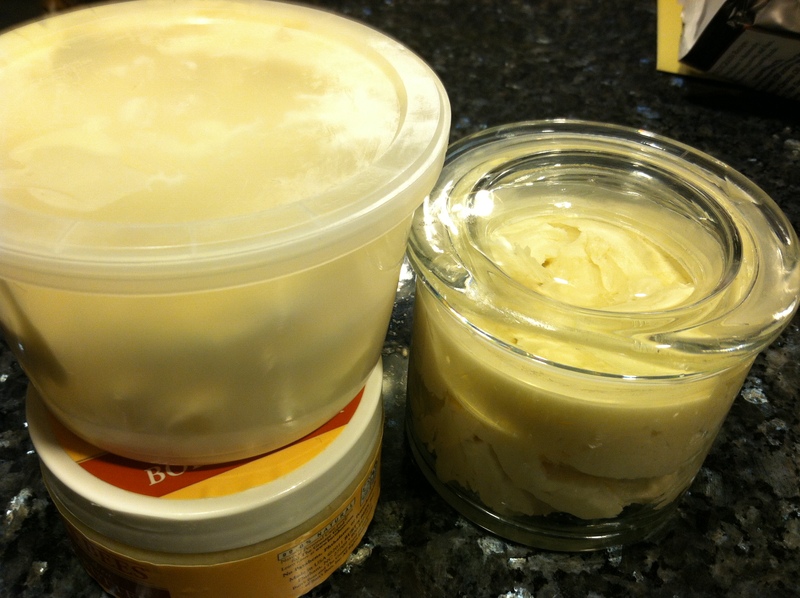 With this recipe, I made about 3 1/2 cups of body butter that cost about $25 for materials. I was spending $13 for a 6.75 ounce container from Burt’s Bees. After some calculation, I figured that if I bought 3 1/2 cups of body butter from Burt’s Bees, it would have cost me twice as much. Plus, I knew exactly what went into it. Enough body butter to slather on for months! I am thinking about making another batch for Christmas gifts!